Or more particularly let’s talk about how charities don’t have to distribute. Well dear readers the countdown has started to becoming a grown up again. Have been doing the ‘coffee thing’ and put my first real paid job application in on Friday. Most importantly checking my work clothes still fit after a year in active wear. And trying to blot out the horror that is womens work shoes. Not big on shoes at the best of times. Must be why I like yoga. Now whether our remaining time together is long or short is out of my hands. But I’ll try to get up to date on some of the things I have been promising and not delivering on. And today is Charities. My past ramblings can be found here, here, here, and here. Sometime pre Jacinda Matt Nippert started a series of articles on charities. The last one was all about how charities don’t actually have to distribute to worthy causes to be a charity. The highlight of the article was of course the quote from your correspondent that this was not a good thing. All about the value add me. So today dear readers the explanation. 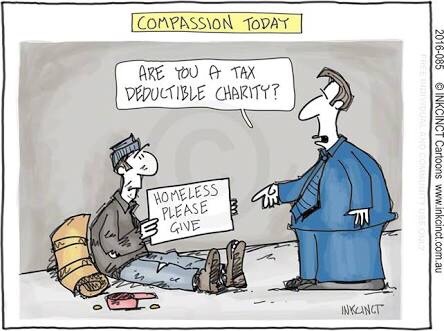 You get how it is that even though charities get an income tax exemption and a one third subsidy on their donations from the people of New Zealand – the dosh doesn’t actually have to get to the people the charity is serving. And as a special bonus issue you also get how businesses don’t even have to be registered with Charities Services to get the tax exemption. So good. No wonder we have so many charities in New Zealand. Section CW 43 makes business income tax exempt if it is carried out directly or indirectly for the benefit of a charity. What the indirectly thing means is a company or other entity owned or controlled by a charity. And yes the charity has to be registered but no actual like requirement that any subsidiary company is. But it has to be for the benefit of the charity though. So maybe that means the dosh has to flow up to the actual charity? Well maybe dear readers. Remember how with accounting tax expense – this was tax that would need to be paid at some stage? Yeah well it is kinda similar here. The lead case on all this stuff is an Australian one called Bargwanna. At least 4 courts over at least 10 years with shambolic facts and varying legal arguments. While the Commissioner ultimately won the case and the trust was found not charitable; it was a somewhat pyrrhic victory. As along the way the ATO lost its long held view that charities had to distribute its funds in order to be a charity. That is the word applied as in applied to a charitable purpose didn’t mean distribute but more a vibey thing of consistent with its trust deed. Oh and of course it never meant distributing its capital. I mean steady on. Now while this might be all beautifully consistent with twelve thousand million years of trust jurisprudence; it does IMHO rather take the taxpayer for a mug. Remember the donations tax credit. Remember how for every three dollars you give a charity the government gives you one dollar back? Now that donation could be considered capital by the charity. So no need for it to go anywhere except infrastructure – or an investment base on which income will also be taxfree – for the charity. And imagine if that were a charity you set up and controlled yourself? Knighthoods anyone? Or alternatively maybe tax preferences – donations tax credit and all – are given to charities not so they can create beautiful balance sheets in perpetuity; but maybe it is to support them doing good things for the community? And yes I know it does include the advancement of religion – thank you Brian Tamaki. But maybe? Now of course in New Zealand our word is benefit rather than applied. But not really much comfort as benefit is arguably looser than applied. So tax free income of charity businesses can continue to roll up and support the charity business’ balance sheet just so long as it benefited the charity in some undefined form. But applied does turn up somewhere. It turns up in the deregistration tax for charities. All through consultation and the legislative process the deal was that the tax would apply unless the net assets were distributed to another registered charity. Except at the last minute as a drafting matter – distributed became distributed or applied. While this may not have much effect in practice; it does mean that charitable companies who were previously registered with the Charities Commission and then deregister won’t have to pay the tax and won’t have to distribute their assets. Because their assets are by definition already applied for the benefit of the head charity. Awesome thanks Bargwanna. Still tax exempt under section CW 43 and no more nasty public disclosure with Charities Services. To be fair though – more an issue of the underlying mess that is our tax and charites law than the addition of the word applied. Now the last two governments have got close to the whole charities and businesses thing and then run away. No actual sign it is even on the radar with this one. Maybe once they’ve fixed the housing crisis?